On paper, Wario World sounds like some kind of dream come true: a beat-em-up starring Wario created by Treasure, the developer behind such outrageous action games as Gunstar Heroes and Dynamite Heady? Sign me up! Unfortunately, in execution, the 2003 GameCube title falls well below expectations. And what should have been an easy winner for Treasure and Nintendo instead feels like a tedious time-waster, and a missed opportunity. Of all Nintendo’s iconic characters, Wario seems to be the most fitting to star in a beat-em-up. The burly anti-Mario is a greedy, selfish brute. It just makes sense for him to be the one to pummel enemies to a pulp over pretty much any other Nintendo character. And Wario World gets off to a decent start in that regard. Wario can punch enemies, perform his signature charge attack from the Wario Land games, and perform a ground pound (as platforming heroes wont to do). But this time around, Wario can also pick up KO’ed foes and proceed to throw them, swing them around, or pile drive them like a pro wrestler. Similarly, the enemies at first seem to show some promise: You have tiny foes who are taken out with a single punch. Slightly bigger foes get knocked out after a few hits, thus allowing you to perform the aforementioned throwing, swinging and pile driving. 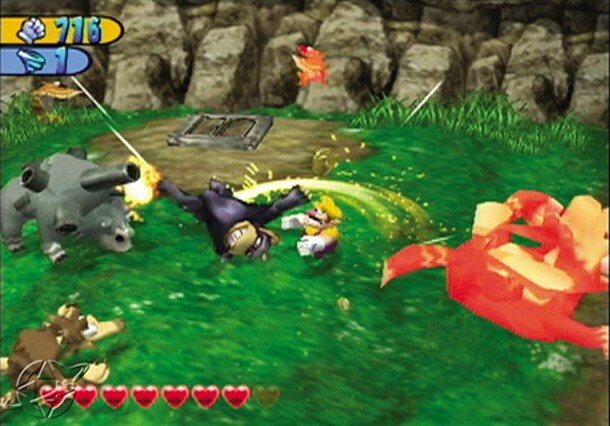 And some large and flying enemies show up and require a little more clever uses of Wario’s abilities. At first glance, you might think Wario World is heading in the right direction. But then it quickly becomes apparent that you’re just doing the same thing over and over again. There’s not enough variety (or polish) in the combat to make Wario World feel like a memorable beat-em-up. And much like Wario’s moveset, the enemies also rapidly reveal their limitations, with each of the game’s stages simply putting different skins on the same few enemy types. The only thing preventing the game from reaching absolute monotony is if you’re gunning for 100% completion. Each level houses eight bonus stages, with red rubies waiting at the goal of each. The bonus rounds range from single room puzzles to platforming challenges that bring to mind the bonus stages of Super Mario Sunshine. You only need some of the rubies to complete a stage (three in World 1, four in 2, five in 3, and six in 4), but for completionists, there are more to get your hands on. 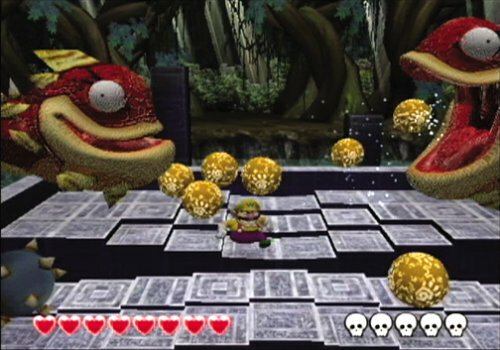 Other collectibles include eight fragments of a gold Wario statue on every level, with completion of a stage’s statue increasing Wario’s health by half a heart. There are also eight unique treasures to be found on every level, which appear on a certain colored pad on the ground if you’ve found and pressed the button of the same color. Finally, there are five captive ‘Spritelings’ to be rescued on every level. The more Spritelings you rescue, the better the game’s ending will be for Wario. It may sound like Treasure added a good amount of content to the stages via these collectibles, but unfortunately, there are more than a few elements that make you not really care about what Treasure crammed into their levels. Along with the repetitious combat and bland enemies, the camera controls are exceedingly clunky (which makes the Sunshine-esque bonus stages way more difficult than they’d otherwise be), and the level design leaves a whole lot to be desired. Without good gameplay and level design, the collectibles come across more like an arduous chore than an engaging side quest. If on the off-chance you actually manage to get into Wario World, you won’t be into it very long. The game features four worlds plus a final boss, with each world housing only two stages and a boss fight of their own. The whole game can be completed in a couple of hours, which wouldn’t be a bad thing if what the game did boast were memorable. Sadly, it isn’t. This makes Wario World feeling completely absent of depth and creativity, leaving the game feeling shallow and pointless. It’s hard to recommend Wario World to anyone but the most diehard of GameCube nostalgics. While the concept shows some promise (especially when paired with its developer), Wario World fails to fulfill that promise. 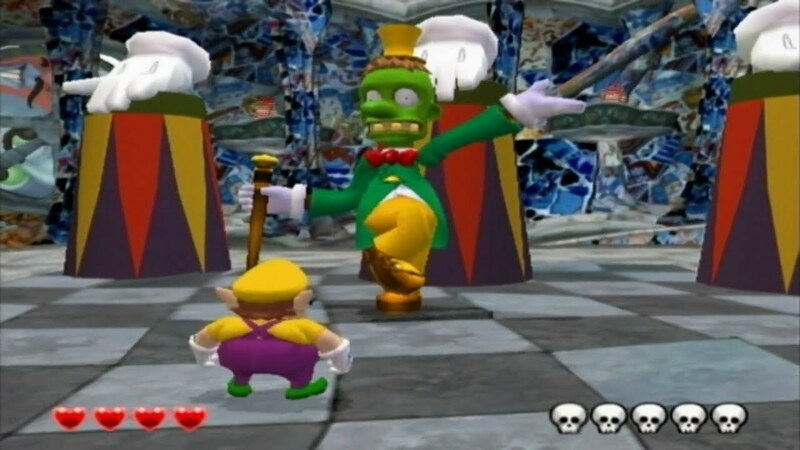 Though it looked decent in its day, Wario’s sense of control felt more like something from the early years of the Nintendo 64, as opposed to the GameCube title it actually was. Somehow, what should have been a wonderful joint venture between Nintendo and Treasure ended up being a disappointment to both parties involved, let alone the player. As a big Wario fan, I have always wanted to play this one. So much, in fact, that recently I went online looking for used copies of it only to find out they are being sold for absurd prices! I guess that considering both that and your score, I ought to stay away from it. This game was released long before I discovered Super Mario Land 3, but even after playing it, I have to say Wario World doesn’t look too interesting. Treasure is a highly-regarded company, but they can be a little hit-or-miss at times, and this game seems to prove that. It’s no Gunstar Heroes. That’s for sure.